Play starts with the black/orange player passing the ball towards the mannequin. The Blue player steps in and intercepts the ball. This leads to a 3v2 for blue looking to finish on goal. If the blue team turns the ball over it becomes a 2v1 for black/orange against the blue. The blue player who gives the ball away becomes the 1 defender. 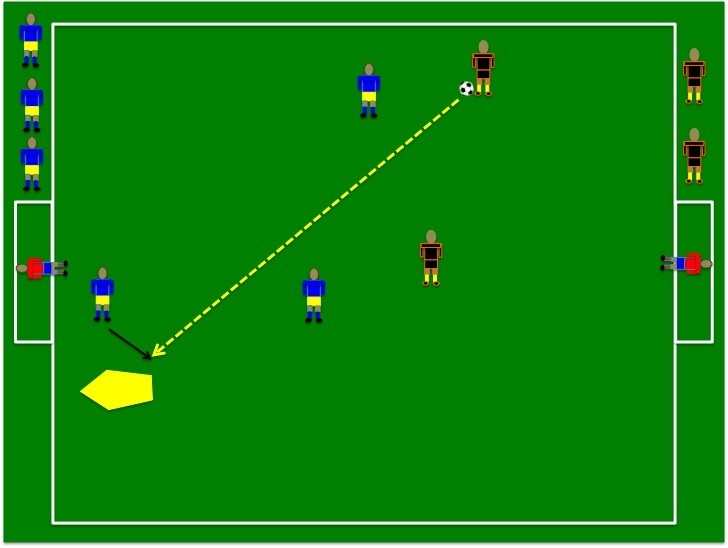 If blue shoots the ball and the keeper saves it – the blue player who shot will become the 1 defender as the other 2 blue players will jog off the field. Consider making a time limit of 5-6 seconds to get a shot off to encourage quick attacking movements.